Consider your climate, your soil, the location of the plants and your tolerance for thorns! Some of the tastiest and most prolific berries have thorns. Decide which varieties best suit your needs. 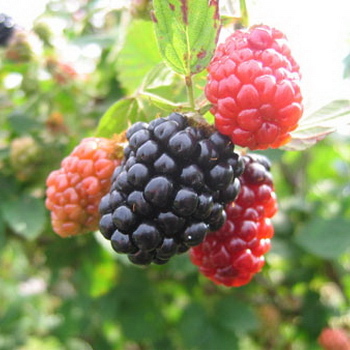 Blackberries flourish in full sun in most climates and they prefer rich, moist soil and generous fertilization. Drip irrigation is recommended as the leaves will stay dry and the plants are less likely to get rust, a fungal disease. The trailing canes need major support, typically a fence, and the more upright varieties such as Apache and Navajo also do better with some support. Allow the plants to grow naturally the first year and then train them on the supports the second year. The trailing varieties can be tied or woven along the supports. After producing berries, the fruiting canes should be cut to the ground. An easy method for yearly pruning is mentioned in Robert Kourik’s book “Your edible landscape, naturally”. Plant twice as many rows of blackberries as you need; each year cut every other row to the ground. The berries are usually planted 3 feet apart, in rows 5 to 6 feet apart. Blackberries freeze very well. They are better suited for jelly than jam, due to the abundance of seeds. Blackberry cobbler is a favorite summertime dessert. Toss 4 ½ cups of berries with 1/3 cup of sugar and 1 ½ tablespoons of flour. Let stand while you are making the dough. Combine 1 ½ cups of flour, 3/8 teaspoon salt, 1 ½ tablespoons of sugar and 2 ¼ teaspoons of baking powder. Cut 6 tablespoons of butter into the mixture using a pastry cutter or two knives, until the mixture resembles coarse cornmeal. Add ¾ cup whipping cream or half and half and mix lightly. Put the berries into a 1 ½ quart baking dish. Press the dough into patties, about 2 ½” wide and ½” thick. Place them atop the berries and bake at 375 degrees 35 to 40 minutes. You can serve cobbler with whipped cream or ice cream. First written mention of gooseberries was in England in 1276. They became very popular in that country and there were hundreds of varieties by the nineteenth century. It became great sport to see who could produce the variety with the largest berries. American varieties have been bred, usually exhibiting smaller berries, but being more resistant to mildew, a disease common with the European varieties. Raspberries are heralded by many as the tastiest of all berries. They are very delicate and cannot be kept for longer than a few days – a week at most in the refrigerator. They do, however, freeze well. Raspberries are red, black or yellow. Fall Gold, our yellow variety, has a most subtle yet delicious flavor. 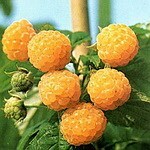 Cultivation of raspberries is most successful in areas with cool summers. In hottest areas, some shade is advisable. Generally, the raspberry canes grow to their full size the first year and bear fruit the second. After fruiting, the canes die and new ones replace them. The plants require good drainage, even moisture and fertilization when they are in bloom. Mulching will help keep the soil moist. Plant about 3 feet apart in rows 6 to 10 feet apart. The plants can be treated as freestanding shrubs, but are more satisfactory trained on a fence or a set of wires. Red and yellow varieties require different pruning techniques than the black ones. Consult a pruning book for specific instructions. Raspberries make great jam and many delicious desserts. The following is a recipe for a lovely salad. If you are unable to find a good raspberry vinegar – some of them are quite tasteless - here’s a simple recipe. The vinegar will last a long time! Combine 2 ½ cups of red raspberries, lightly mashed, 2 tablespoons sugar and 2 cups of red wine vinegar in the top of a double boiler. Cook over barely simmering water, uncovered for 10 min. Place in a jar and store for 3 weeks. Then strain and rebottle. Prepare the dressing by whisking together 3 tablespoons of raspberry vinegar, 1 tablespoon of sugar, 1/3 cup of olive oil, 1 tablespoon sour cream and ½ to 1 tablespoon of Dijon mustard. Place washed, bite size lettuce (Butter or romaine, etc.) on individual plates . Top with the walnuts and approximately 2 tablespoons of fresh or frozen raspberries. In Elizabeth Schneider’s book “Uncommon Fruits & Vegetables” she recommends preparing the berries in a syrup before using them in compotes, tarts, or with ice cream, etc. To prepare the syrup, nip off the little stems and tops (most easily done with a pair of scissors) of 1 pint of the berries. Boil 1 cup of water and ½ cup of sugar in a non-aluminum pan. Add the berries and cook over very low heat until the berries are barely tender and almost opaque, about 4 minutes. Gently pour in a dish and chill until ready to use. Ms. Schneider’s book contains several very interesting recipes for this old-fashioned fruit. Blackberry with medium to large black fruit with honey sweet flavor. Vigorous grower with semi-erect, thornless, heavy yielding canes. Rarely suckers, very disease resistant. Requires summer heat to fully ripen. Ripens in July. Cold hardy to USDA zone 5. Large, firm, high quality fruit with sweet, very good flavor. Similar to Hull with better resistance to cane blight, slightly hardier. Will not soften, leak or lose color in hot weather. Cold hardy to -12 degrees F; most winter hardy of the thornless varieties. Semi-upright. Late season producer with very long production season. Large, firm, conical glossy black berries with excellent flavor. Heavy crops produced on semi-erect canes. Very winter hardy. Zones 5 to 9. Ripens from late June into August. Blackberry with medium to large, bright red to black, firm, very flavorful fruit with faint wild blackberry flavor; similar to Olallie. Excellent quality for fresh eating, freezing, canning. Produces on vigorous, trailing canes. Cold hardy to zone 5; best flavor in cooler summer climates. Leading variety in Pacific Northwest. Ripens mid July to mid August. Large, shiny, firm black fruit. 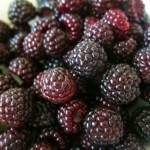 Sweet, less tart than blackberries; will sweeten even in cool coastal climates. Vigorous grower, very productive. Commercial variety in California. Ripens in June. Named for its three crowning attributes: flavor, productivity and vigor. High yields begin with first harvest from mid July to mid August. Semi-erect thornless canes can grow 12-15 feet long and bear large, firm, tasty berries. Winter hardy to USDA Zone 5. Large, soft, reddish black fruit. Very juicy with sweet-tart flavor and delightful aroma. Good for canning, freezing and eating fresh. Boysenberries produce in mild winter areas; can be grown on coast or inland. Ripens in June. Less vigorous with lower yields than regular boysenberry. Extremely large, almost seedless, juicy, sweet berries, 1 1/2 to 2 1/2" long and 1" wide. Juicy, full-bodied flavor, more than a blackberry. Plant grows five feet tall. Bears the first year after planting. Heavy producer during May and June. Hardy in Zones 5-9. Requires winter protection below -5 degrees F.
Award winning variety that produces excellent large sweet fruit. Outstanding flavor when vine-ripened. Vigorous shrub is very disease resistant. Extremely cold hardy. Zones 3 to 8. Potted. Large, oval, light green berries turn rosy pink when fully ripe. The fruit is soft, juicy and high in sugar, with rich pink flesh. Makes excellent pies and preserves. Bush is moderately vigorous and productive. It is an upright grower with ornamental, glossy, dark green leaves; practically thornless. Mildew resistant. Thrives in partial shade where summers are hot; drought tolerant. Leaves turn purple in fall. Hardy in Zones 3-9. Thought to be a wild cross between a red raspberry and a blackberry. Soft, medium to large, lavender-red berry does not darken while ripening. Unique tart or sour flavor because of high acidity. Loganberries are highly prized for pies, juice, canning and wine making. Thornless canes with average yield; very drought tolerant. Needs cold winter to set well. Hardiness similar to Boysenberry. Ripens in June. Everbearing. Large, firm yellow fruit with very sweet flavor. Ripens late August through October. Cold hardy to zone 3. Patent no. 10411. Potted. Extra large red raspberries up to an inch and a half long. Fine flavor, excellent for all uses. Hardy to 0 degrees F, but does well in warmest climates of the USA. Large crop in June and a smaller one in autumn. Propagated by tissue culture to ensure varietal integrity. Patent No. 4732. Potted. Medium to large. Light red berry. Firm, sweet and excellent for fresh use or freezing. Vigorous canes. Moderate winter hardiness. Likes cooler summers. Nearly thornless at harvest heights. High level of virus and aphid immunity. Hardy to Zone 5. Ripens in June. Fall bearing red raspberry with exceptional flavor. Very good yields and tolerant of phytophthora root rot. Widely adaptable. Great performer for commercial and home gardens. Hardy to zone 4. Potted. Everbearing. 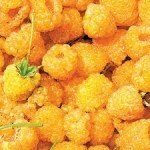 Golden raspberries are very sweet, large to very large, conical, soft, juicy and non-crumbling. Excellent for fresh eating and processing. Adaptable to a wide variety of soils. Highly recommended for upper south and mountain areas; not recommended for extreme northern areas. Plant is vigorous and winter hardy to zone 4. Ripens in July and September in warmer areas and late spring and July/August until hard frost in cooler areas. Everbearing. Very large, firm berry; popular commercial raspberry variety. Bears excellent quality moderate early July crop and heavy crop of medium quality early September fruit. Vigorous, hardy canes are erect and need no staking or tying. Most popular fall variety nationwide; very adaptable. Compact clusters of large to very large glossy black berries of very high quality. Firm and juicy with rich flavor. Extremely vigorous and productive. Most disease resistant of all black raspberries. Cold hardy to zone 4. Potted. Large, medium red color. Delicious flavor, heavy producer. 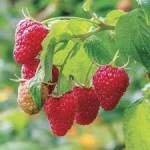 Good raspberry for cold climates, avoid humid summers. Ripens June to July. Also known as wolfberry. Weeping shrub reaches six to nine feet and produces copious quantities of small, bright red berries that can be eaten fresh, dried or used in cooking. Highest level of antioxidants of any food plant. Also high in protein and amino acids. Fruit starts ripening in July. Afternoon shade in hottest climates. Prefers well-drained soil. Self-fruitful. Zones 5-9. Potted.